Do you have allergies and contact lenses? Once spring hits, it seems every week something new is in bloom. And consequently there’s a new allergy of some kind to combat. For allergy sufferers, this yearly problem is no picnic. But, if you’re a contact lens wearer to boot, you may be in for extra discomfort. 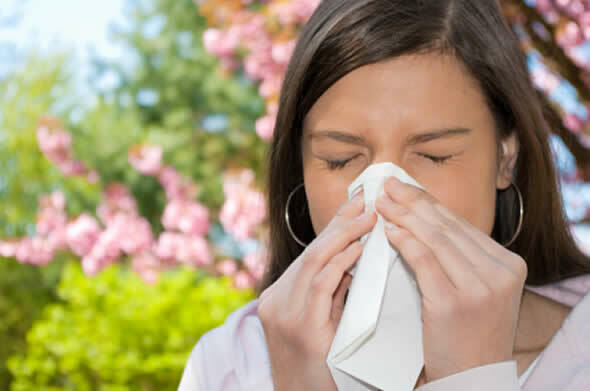 Even if you wear contact lens regularly without problems, the allergy season can make your contacts a misery. Here’s why. Pollen and other airborne material that produce allergic reactions are sometimes amplified by contact lenses. Pollen can get on your lenses, which in itself is irritating, but causing discomfort. Allergens also can stimulate the excessive production of natural substances in your eyes. This can bind to your contact lenses and also become uncomfortable. Pollen maps can help you determine when allergens are present. The eyes become red and irritated and excessive tearing can occur, leading to blurred vision and discomfort. Allergies and contact lenses can be a drag. Sometimes the reaction is the result of preservatives in the lens cleaning solution. It happens more often with soft contact lenses. Treatments include removing the lens for a time, changing solutions and using different storage methods. Ask your eye doctor about eye drops that can help relieve your symptoms and keep your contact lenses clean. Certain drops can discolor or damage certain lenses, so it makes sense to ask first before trying out a new brand. Small pieces of eyelash, cotton threads, airborne plant material and much more can all wind up in the eye. In the absence of contacts these things are normally washed away by the tears and eyelid working together. Contacts can interfere with that process. In many instances, antibiotics are called for since infection is common under these circumstances. Modern contacts are manufactured to extremely high standards. Millions wear them daily and for years without health problems or even discomfort. Still, about 4% of all contact lens users experience some type of health issue at some point. Risks of wearing contact lenses, while very low, are not zero. Your odds can be improved by proper use, though. One overall issue is the fact that any contact lens will restrict the amount of air that gets to the eye. That increases the odds of infection, even when lenses are well sterilized. With the popularity of 7 day or even 30-day continuous wear lenses, that problem (while small) is larger than it was in the past. Apart from infection, discomfort and blurred vision can occur when a lens is worn for more than a few days. That irritation can occur to the eyeball itself, and also to the lens and surrounding tissues. One possible result is GPC (Giant Papillary Conjunctivitis). GPC produces itching and redness on the surrounding tissue, the result of protein buildup on the surfaces of the lens. Swelling occurs on the interior surface of the eyelids and can produce a sticky discharge as well. When this occurs, you should discontinue use until your eye care professional declares the lenses are safe to wear again. Regular, careful lens care and proper use can reduce the odds of any re-occurrence. Corneal abrasions, while uncommon, are also far from unknown among contact lens users. A small scratch on the clear tissue over the pupil can happen when small particles of grit get between the lens and the eye, usually as a result of poor cleaning or handling. But it can occur even to the most careful, as airborne or finger-borne material lands on the surface of the eyeball. The lenses themselves can cause problems if they change shape. While rare, previously well-fitting contact lenses can be affected by temperature and age, causing tears and oxygen to less efficiently make it to the eye. This so-called Tight Lens Condition can cause pain, redness and even swelling of the cornea. Correction consists of remeasuring the eye and fitting new contacts after the eyes have recovered. The cornea itself can change shape, as can the whole eyeball. The change is subtle, but with contact lenses the tolerances are small. If corneal warpage (as it’s called) does happen the result can be discomfort and an increase in the odds of infection. The condition is more common with gas permeable and hard lenses, which are less flexible than soft contact lenses. If this happens, healing can take weeks or months, during which time contact lenses can’t be worn. As the eye resumes its normal shape, vision can change. More than one glasses prescription may be required for optimal sight. In rare cases the astigmatism is permanent. In all cases, following the manufacturer’s and your eye care professional’s guidance about cleaning, insertion and removal, contact lens care and wear are your best bet to avoiding problems. Please note: contact lenses, even if worn for cosmetic reasons, are medical devices that should be worn under the prescription, direction, and supervision of an eye care professional.